Karnataka is seeking water from the river for meeting drinking water requirements in northern parts of the state where it has become an emotive political issue. 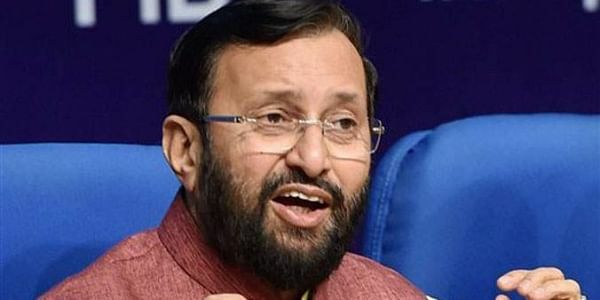 BENGALURU: Union minister Prakash Javadekar today rapped the Congress for its 'double-speak' on Mahadayi river water dispute with Goa, and blamed Sonia Gandhi for the stalemate. "Here is a Goa Chief Minister, with magnanimity he says, he is ready to solve the issue and give drinking water required to the drought affected Karnataka. Instead of welcoming it, Congress is opposing in Goa, but raising questions against BJP in Karnataka." They cannot indulge in double-speak. People are not fools," Javadekar, the minister for Human Resource Development, told reporters here. The Congress was instigating people when they have welcomed Manohar Parrikar's gesture, Javadekar said. People were sure that when B S Yeddyurappa (BJP Karnataka state president) would don chief minister's mantle things would move fast, not like it was happening during Siddaramaiah's rule, Javadekar, BJP's election in-charge for Karnataka assembly polls due early next year, said. Parrikar, in a letter to Yeddyurappa on December 21, had said, in principle, Goa would not oppose the "reasonable" and "justified" quantum of water meant to be utilised for drinking while pointing out that the matter was pending before the Mahadayi Water Disputes Tribunal. Javadekar blamed the Congress by labelling them as "culprits and villain" for not solving the dispute when they were ruling in both Goa and at the Centre. It was during Atal Behari Vajpayee's rule that Mahadayi project got in-principle approval in 2001, he said. Congress had been betraying Karnataka over the issue which was also reflected in Sonia Gandhi's statement of not letting a single drop of water to Karnataka during Goa elections in 2012, he said. In fact, it was during B S Yeddyurappa-led regime work on Mahadayi project began in 2007, he said. In a counter attack, Siddaramaiah yesterday had accused Parrikar and Yeddyurappa of trying to play out a 'drama' on the issue, keeping upcoming assembly elections in the state in mind. Karnataka is seeking release of 7.56 tmcft water by Goa from the river for the Kalasa-Banduri Nala project, being undertaken to improve drinking water supply to the twin cities of Hubballi-Dharwad and districts of Belagavi and Gadag in the state's northern region. The project involves building barrages across Kalasa and Banduri, tributaries of Mahadayi river, to divert this amount of water to the Malaprabha which meets drinking water needs of the region. Goa had earlier expressed its opposition to the out of court settlement of the dispute, and had not responded positively for the proposed meeting of chief ministers. Goa's willingness to consider an amicable settlement to the issue now has come after Shah mediated a meeting between BJP leaders from Karnataka and the party ruled western state. Besides Karnataka and Goa, Maharashtra is also a riparian state sharing the Mahadayi river waters.